• Reduce IT management burden. • Simplify IT and automate. • Ensure service-level agreements are met. –Bob Madaio, Hitachi Vantara, and Lee Caswell, VMware. 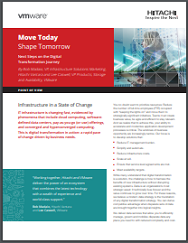 Learn to shape tomorrow and define the next steps of your digital transformation in this Point of View.